Packing a travel busy bag is tricky business. Pack too little and you'll be trying to turn napkins into toys. Pack too much, and your backpack will be so heavy that you are sorry you ever left home. Last week I posted a picture of our most recent travel busy bag, and now I want to share my thoughts on how to build your own. After four-plus years of experimenting, here are my best tips for packing an airline busy bag. What makes a good airplane toy? Engaging. Self contained crafts are especially great, but be wary of crafts that might make a mess or contain smelly glues or paints. What makes a good "mix"
Choose toys that let your child engage in different types of play - for example, instead of four coloring books you would have one coloring book and some action figures or other manipulative toys. Instead of four cars, you might have a car, a driver, a bicycle and a horse. Choose toys that work well together. For example, I might start with a Playmobil person and horse. When that gets boring, I could add a stroller, or a wheelchair or a car to the mix. Ask your child to draw a road a piece of paper, and let them "drive" a toy car on the road. Include something soothing, like a storybook. Plan to let the kids shop for some special new toys at your destination. You can use them on the return journey. A good rule of thumb is one brand new toy per hour, along with some old favorites. Be sure to bring along a few toys that are intended for the return flight. If you use more toys than you had planned on the outbound flight, you can always pick up something new at your destination. You can find good toys almost anywhere. It helps to keep an eye out for travel toys throughout the year, and stow them in your empty suitcase until you need them. Here are some of my favorite places to find airplane goodies. What else can your child play with? Keep an open mind, and you'll find lots to do without breaking into your busy bag! Anything in the seat pocket. For example, my kids are always interested in the emergency information cards and in learning how all of the various doors on the plane open. Even the barf bag can be made into a puppet or used in play. A parent! The best way to ensure good airplane behavior is to pay lots of attention to your child when they first get on the plane - if your home is as busy as mine, that's a rare treat that kids will, quite literally, bend over backwards to encourage. 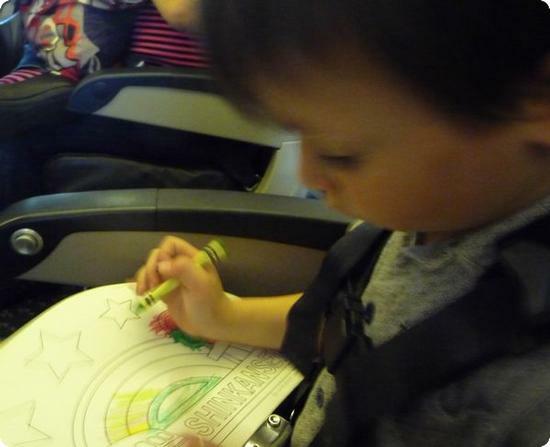 Here are some more tips for keeping your child busy on a plane without using toys. Wait to bring out your busy bag until you've exhausted all the "built-in" entertainment. Try not to open the busy bag in the airport terminal. As exhausted as you might be, the terminal is the place for your child to stretch their legs and, if possible, run. Consider wrapping each item. Young children are so thrilled with unwrapping "gifts" that they won't mind if you wrap something they already own. Amy @ The Q Family on November 9, 2009 at 6:30 a.m. I love the idea of wrapping the toy so they will be excited to open up a new present. Shelly (Travels with Baby) on November 9, 2009 at 2:24 p.m.
Jean - OurExplorer Tour Guide on November 9, 2009 at 11:56 p.m. Very good tips and thanks for sharing. Quite agree with your criteria on "what makes a good airplane toy". Once met a family traveling with kids, the boys could be very noisy with some toys while so engaged and quiet playing other toys. Victoria on November 10, 2009 at 8:57 a.m. Excellent tips, all of which I agree with ;) I can't wait to go to Japan to stock up my craft cupboard, I remember their stationary shops being amazing. Holly White-Wolfe on March 10, 2010 at 5:50 a.m.
We are taking our first family plane ride this month and I am sure to take along these ideas for my busy 3 year old boy! I wrote an article about traveling with kids too - it can really take some good planning ahead can't it?